The Conium Review and Conium Press publishes innovative writing. We lean toward unconventional plots, bizarre settings, and experimental language. Get weird with it. We are especially interested in work from women, LGBTQIA authors, and writers of color. We have previously worked with Submission Bombers and other groups to encourage submissions from marginalized writers. The Conium Review is distributed through the Ingram Book Group. Stock and availability changes regularly, but we’re often shelved at independent bookstores, including Powell’s Books, Elliott Bay Book Company, Quimby’s Bookstore, and Skylight Books. Additionally, we donate a portion of every print-run to charities like Open Books and Housing Works Bookstore Cafe. Conium Press publishes one to three standalone titles per year. Each year’s publishing decisions are determined based on available budget and editorial workload. We think books should take risks, and we like gravitate toward titles that might get overlooked elsewhere. Our forthcoming catalog for 2019 includes Emily Koon’s We Are Still Here. 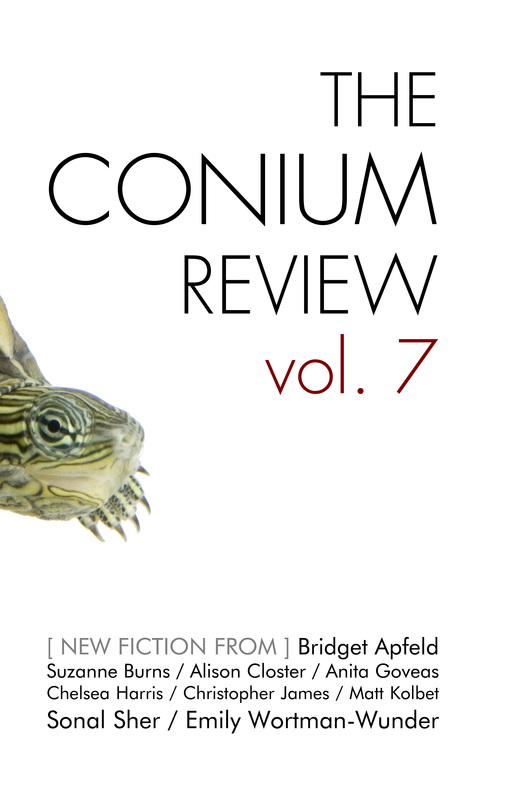 We also publish flash fiction and marginalia through The Conium Review Online Compendium (i.e. our blog with a pretentious-sounding name). Work from the site has been selected for the Queen’s Ferry Press Best Small Fictions anthology, placed in the Vestal Review Award, long-listed for the Wigleaf Top 50 (Very) Short Fictions, and selected for the Ploughshares “Best Short Story” feature. If you have questions about our small press, please e-mail editors@coniumreview.com. Niche Magazine interview with our managing editor as part of their “Journal Spotlight” series. LitBridge intereview with our managing editor. Duotrope’s Digest interview with several members of our editorial staff. The Grub Daily micro-interview with our managing editor for Grub Street’s annual “The Muse and The Marketplace” conference.